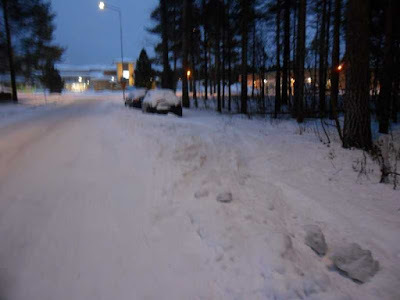 On street parking in the winter is not nice. It's not nice for the poor Mr. SnowPlowMan who has to clear the treet but the snow pile zone is full of parked cars. Nor it is fun for the drivers who get their cars blocked by the snowpiles, and have to scrape the windows clean and shovel the snow off the roof. And then they have to try starting the car without the benefit of electric heating, causing extra wear and tear in the engines if it's cold. And create clouds of pollution from the cold-start. Meanwhile, bike parking on the bikeway is not really a thing. First, one can usually park the bike easily in the racks near just a few meters from the front door (if indoor parking is not available/rider too lazy) so why would anyone leave their bike on a bikeway? That'd also mean they walked away, and that's not something we like to discuss here in Very Northern Cycling Blog. Bikes were invented to stop people from walking, you know! And there's the danger of snow camouflage. 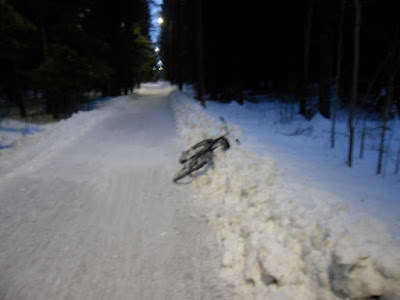 What happens is the bike fell over and then it snowed a lot and Mr SnowPlowMan does not notice there's a bike? Well, he plows it away! I think most of the worst ones will get sent straight to the recycling, but many mangled ruins of a bicycle gets sold every time there's a "Lost&Found" sale. Still, short term parking does happen. Met a friend on a walk, flat tires, the chain came off, it was colder/more slippery than you thought so one has to walk instead, or too much alcohol. In the autumn picking berries and mushrooms are good reasons to stop, but usually one should carry the bike 100 meters into the bushes to leave no clue for others to find your good berry bushes. Maybe the dog got an interesting scent and dragged the rider off to the woods? An unusual sight; on-bikeway parking! Of a bicycle, that is.